An interscalene nerve block is a form of anesthesic that falls into the category of "regional anesthesia". 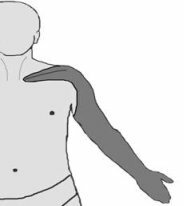 This type of nerve block involves an approach to the brachial plexus, which is a collection of nerves that control the shoulder and arm providing movement and sensation (feeling). The bases of these nerves also called "nerve roots" and arise from the fifth cervical (C5) through the first thoracic (T1)nerves and lay between the anterior scalene and middle scalene muscles and form three "trunks". Local anesthetics applied to these trunks can numb the shoulder, arm or hand. 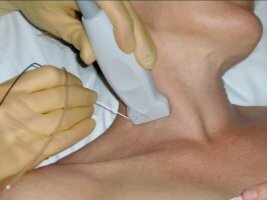 Interscalene nerve blocks are a valuable tool in pain control after various forms of shoulder surgery such as shoulder arthroscopy or replacement procedures. The use of ultrasound guidance has vastly improved the effectiveness of this type of anestheticbecause of the improved accuracy of placement of the catheter and anesthetic agent. These blocks can be performed before or after surgery. It is important, however, for the patient to be awake and responsive so that he/she can relate any expected or unexpected effects from the procedure. For example, a drooping eyelid on the blocked side is a normal side effect of the block, indicating that some of the anesthetic has affected the nerve(s) responsible for movement of the muscles in the eyelid. Additionally, some level of hoarseness in the voice is also a normal side effect of the block, as a portion of the recurrent laryngeal nerve is affected by the anesthetic. Similarly, a mild sensation of shortness of breath may benoted particularly in patients with respiratory disease. These symptoms/side effects can last as long as the effects of the anesthetic last, and will return to normal slowly as the anesthesia begins to wear off. The picture at the left gives you an idea of the pattern of distribution of numbness utilizing this anesthetic technique.You can see how the vast majority of the shoulder is covered by the anesthetic agent, as well as virtually the entire arm..